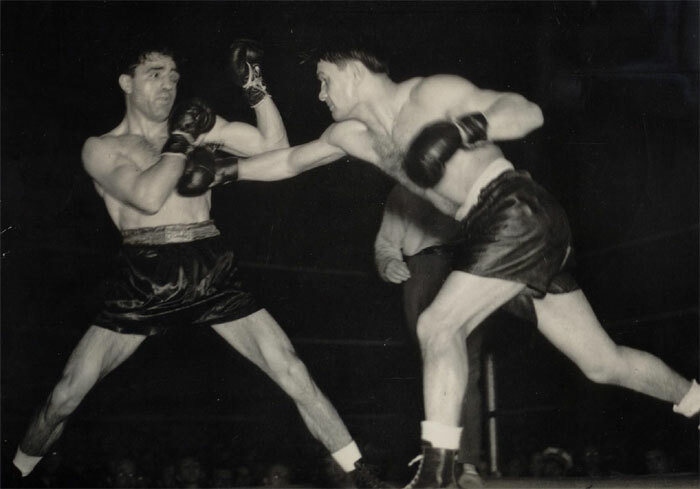 World champion Lou Salica defended his bantamweight title against South Philly's Tommy Forte on this day in 1941, before a packed house at the Philadelphia Arena. Three months earlier, Forte surprised the champion in a non-title bout by winning a 10-round decision in rather easy fashion, flooring and bloodying Salica in the process. The unanimous nod delighted the hometown crowd and Tommy Forte was recognized as the newest sensation in the bantam division. A rematch for the belt was inevitable. Their second go was a fascinating affair. With the pressure on him to prove the first result a fluke, Salica started quickly and won the opening rounds. By the fourth, Forte started to come on, landing shot after shot and eventually closing Salica's left eye. As the fight wore on, the swollen eye became worse and worse, blinding the champ on that side. Some accounts of the fight criticized Forte for not having enough killer instinct to specifically focus on the damaged eye, a mistake that perhaps helped keep Salica in the fight. In the end, the eye held up and Salica did what champions do - found a way to win. Salica rallied down the stretch and the title, seemingly in Forte's grasp, slipped away from the South Philadelphian. The decision was close and controversial, but the champion managed to get back to Brooklyn with his belt. Later in 1941, the two would fight a rubber match outdoors at Shibe Park. The result was another 15-round decision win for Lou Salica. Tommy Forte never made it back to a title contest.